Image 1 of 14: Moonshine Villa at night. 2 of 14: Bedroom One is situated on the upper level. It is equipped with a king size bed; two bedside tables; two reading lamps; dressing table; cable television; air-conditioned; ceiling fan; large walk-in closet; bedroom bench; two armchairs with side table; bathroom en suite with shower area featuring rain and hand held shower heads and wash basin; separate toilet and wash basin. All windows are screened. 3 of 14: Relax poolside and enjoy the sea breeze and stunning views. 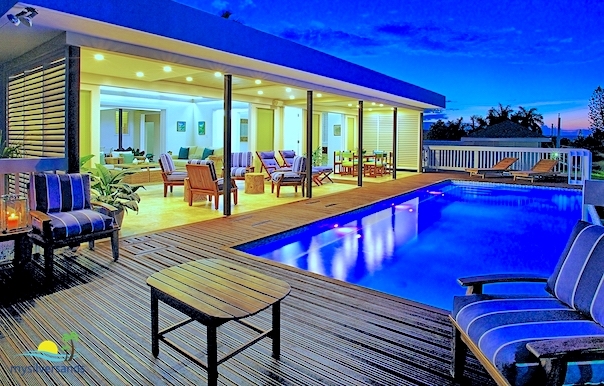 4 of 14: A cool, shaded verandah overlooks the pool. 5 of 14: The swimming pool lines the North side of the villa. 6 of 14: With an indoor garden and wall-mounted flat-screen television, the bright and airy lounge is a great place to relax day and night, and it leads to all three upstairs bedrooms. 7 of 14: Dine indoors in the separate dining room. 8 of 14: Outdoor dining on the verandah, poolside. 9 of 14: Centrally located, the Games & Bar Area is a bright sunny space with indoor gardens. 10 of 14: No description available. 11 of 14: No description available. 12 of 14: Bedroom Two is situated on the upper level. 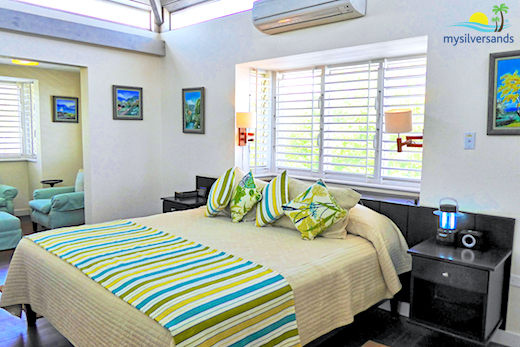 It is equipped with two double beds; bedside table; two reading lamps; dressing table; cable television; air-conditioned; ceiling fan; large walk-in closet; bedroom bench; bathroom en suite with shower featuring rain and hand held shower heads and wash basin. All windows are screened. 13 of 14: Bedroom Three is situated on the upper level. It is equipped with a king size bed; two bedside tables; two reading lamps; dressing table; cable television; air-conditioned; ceiling fan; large walk-in closet; adjacent television and lounge area with two armchairs, two ottomans and side table; bathroom en suite with shower area featuring rain and hand held shower heads and wash basin. All windows are screened. 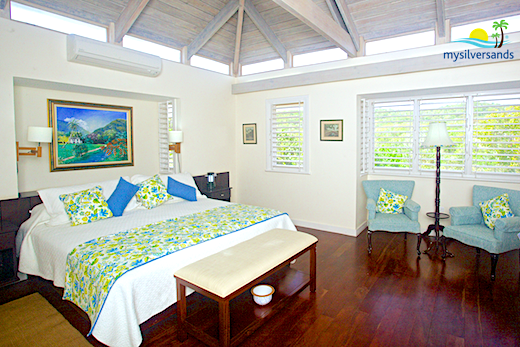 14 of 14: Bedroom 4 is situated on the lower level making it very private with respect to the other bedrooms. It is equipped with a king size bed; two bedside tables; two reading lamps; cable television; air-conditioned; pedestal fan; large walk-in closet; adjacent television and lounge area with two armchairs, desk and chair, and side table; bathroom en suite with shower. All windows are screened. 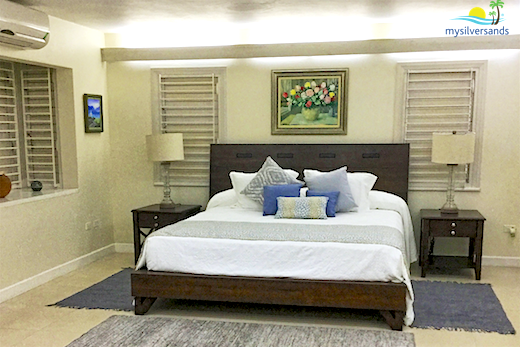 On the North coast of Jamaica, you will find a lovely two-storey villa nestled within the gated community of Silver Sands. 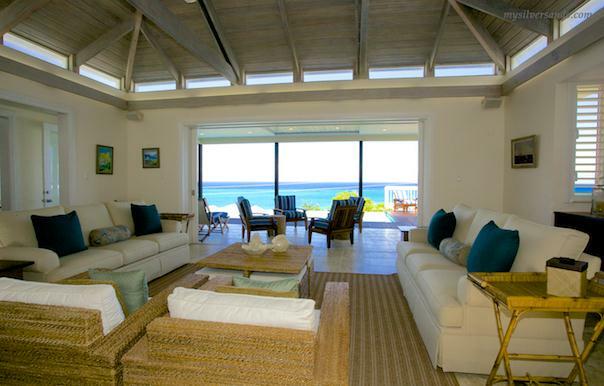 Moonshine Villa is a private sanctuary where you, your friends and your family can experience a one-of-a-kind vacation. Search no more for your dream vacation rental. This is it! On the first floor, an elegant hallway invites you to come explore this luxurious vacation home. The cleverly designed staircase leads to a surprise on the second floor. Upon reaching the top of the stairs, you will find an exquisite living area where tastefully selected sofas and armchairs exude a welcoming ambience for leisurely conversations with friends. 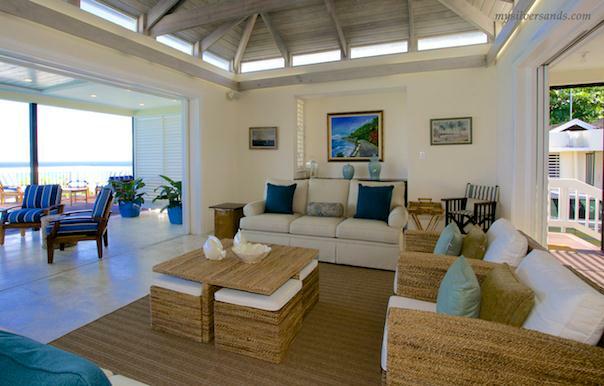 Seamlessly connected to the living area is the spacious verandah overlooking a panoramic view of the Caribbean Sea where your friends and family can enjoy the pool and bask in the radiance of the tropical sun. The crystal water of the infinity pool is hard to resist for children and adults alike. Take a dip, let your body feel the warmth of the water and forget all your worries. Guests adore the creative ceilings of Moonshine Villa. Designed with creamy white coloured wood, it creates an illusion of height. The skylight windows are an impeccable sight when the glow of the sun peers in to shower warm white light to the rooms below. Saunter along the path hand-in-hand with your loved ones to reach the pristine white sand beach just a few minutes walk away from the villa. Meet new friends at the Silver Sands center. Enjoy a scrumptious meal prepared by the talented chef in your comfortable indoor dining room for a family of six where lively chats and hearty laughs can be shared. You can also opt to eat splendid meals in the delightfully bright and sunny outdoor dining area. Sip refreshing drinks at the bar which doubles as a game area, where tropical plants breathe life into indoor planters. 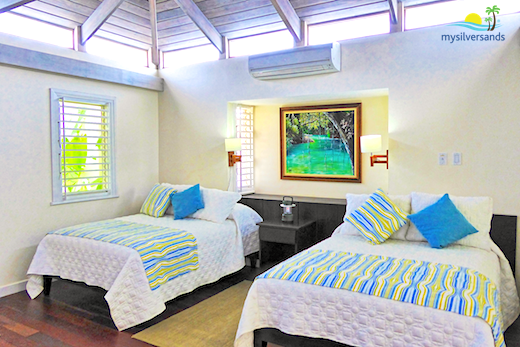 While away your time here with loved ones surrounded by luscious greens and an invigorating summer breeze. The television lounge has a tropical ambiance as there is a charming pocket garden here, too. Families love to spend their downtime in this cozy space. Fast wi-fi internet connection can be enjoyed by everyone throughout the villa. Cradled comfortably in the center of the first bedroom is an elegant king-sized bed dressed in luxurious white sheets. This is what pleasure is all about! It's a marvelous feeling to be pampered once in a while and you will no doubt experience that in the second bedroom of Moonshine Villa, furnished with two quaint and comfy double beds. On the ground floor, there is a fourth bedroom, perhaps the choice of a couple who wish to get away from the rest of the party or typical teenagers seeking to be as far away as possible from the grown-ups. Not everybody talks about this, but storage space when you are on vacation is important. Your clothes and other belongings can be safely and neatly kept in the spacious walk-in closets of Moonshine villa. All bedrooms windows have insect screens. The immaculately clean bathrooms are perfect for tranquil and soothing showers. There are three and a half bathrooms en suite at your convenience. Spotless white kitchen with state-of-the-art equipment facilitates the best of Jamaican cuisine prepared by our friendly staff. Moonshine Villa caters to the needs of guests exceptionally well with three members of staff cheerfully accommodating all your requests. A clean and comfortable complimentary room on the first floor is offered to your staff who accompany you on your travels. Ah, this is the good life! What's not to love about Moonshine Villa! The cozy evening ambience on the pool deck is captivating, incredibly perfect for quality time with your friends and family. You wake up to beautiful mornings greeted by lovely indoor gardens always surprising you with a rejuvenating boost of fresh air. Book Moonshine Villa and experience this irresistible tropical paradise! Moonshine Villa costs from $719.00 to $999.00 per night. Christmas-New Year Period: Minimum two weeks over Christmas and New Year.